who may have been a mere funny animal, but he was the longest-running comic book star the publishing empire of Ned Pines ever had. Pines was one of many pulp magazine publishers who got into comic books the minute they saw what success DC Comics was having with Superman. Like most, he entered the field with a bunch of anthology titles anchored by superheroes, such as Exciting Comics (where The Black Terror was the star), Startling Comics (Fighting Yank) and Thrilling Comics (Doc Strange, no relation). Also like most, he started diversifying the minute it began to look like the public might be getting tired of that genre. In 1942 and '43, he introduced a couple of humor titles for kids, Happy Comics and Coo Coo Comics. 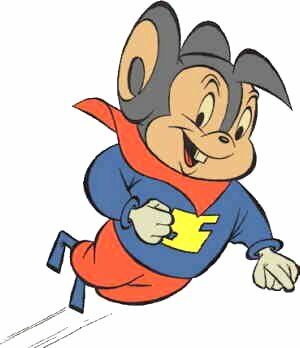 It was in the first issue of the latter (October, 1942) that Supermouse made his debut. October, 1942 was also the month Terrytoons introduced an animated character named Super Mouse. Terrytoons mogul Paul Terry retroactively changed the name of his to Mighty Mouse, to avoid publicizing someone else's character. Between them, these mice were the first two ongoing funny animal superheroes (tho Bugs Bunny had previously been "Super-Duper Rabbit" in a oneshot story in the Looney Tunes comic book). Since normal publishing lead times caused comic books to appear on the stands a couple of months before their cover dates, the edge goes to this one as the very first to appear before the public — the precursor to DC's Terrific Whatzit, Marvel's Super Rabbit, Fox's Cosmo Cat, and all the rest. Some people say the two super-powered rodents were connected, based on information leakage from Terry's studio to that of Ben Sangor, which packaged comics for Pines. Others say there wasn't. Among the latter is cartoonist Kin Platt (American Eagle), who created the one in comic books, tho it's true he'd worked for Terrytoons in the past. In any case, the name was the only possible connection, as they were two entirely different characters. Soupie (as Supermouse was often addressed) was one of the few married funny animals, as well as one of the few married superheroes. His wife's name was Mabel. He also had a nephew named Roscoe. His arch-enemy was Terrible Tom, a cat. He got his super powers by eating super cheese (which was made from the milk of a super cow); and quite a few stories, especially in the early days, revolved around others either depriving him of his stash or making use of it themselves. And never mind the fact that super cheese, like the substances ingested by Atomic Mouse, Elongated Man and many other superheroes both smooth-skinned and furry, was what we would nowadays call a drug. Supermouse went on to become either the most successful funny animal superhero ever to come out of comic books or the second-most, depending on whether or not Super Goof's secret identity as Disney's Goofy disqualifies him as a native-born comic book character. Tho the Coo Coo title fell by the wayside in 1952, he'd gotten his own comic in '48, and kept it until Fall, 1958. It ended only when the publishing company itself (which had gone by the names Standard, Better, Nedor and several others over the years) folded. Among the writers and artists to work on the character were Dan Gordon (creator of The Flintstones), Richard Hughes (creator of Herbie) and Gene Fawcette (who had credits at Quality Comics, Dell and many other publishers). In the years since, there have been a few unauthorized reprints of Supermouse, and a handful of stories can be found here and there on the Internet. It isn't even clear who, if anyone, owns the rights to the old Standard/Pines/Nedor characters. Still, as the spiritual ancestor of Captain Carrot, The Spectacular Spider-Ham, Fearless Fly, Courageous Cat and all the rest, he has a permanent place in cartoon history. Text ©2003-10 Donald D. Markstein. Art © Standard Comics.